“Meanwhile I have decided to carry on campaigning in Lynn's name to promote awareness of ME and to raise money for research. Research is the key to understanding this illness and Lynn has already made her own contribution. When her body was examined by the pathologist who specialised in M.E, he discovered “dorsal root ganglionitis” - infected nerve roots – and nodules of Nageotte, which are little tombs of dead cells, in her spinal cord. These would have caused her terrible pain and sensory nerve damage. They found similar cells in the body of Sophia Mirza, an ME sufferer who died in 2005 at the age of 32, and I believe in other sufferers. These findings are proof that Lynn's ME was a neurological disease”. We sincerely share that hope and extend our deep respect to Kay for all she has been through and our grateful thanks to her for all she is doing to help make that hope a reality. You can read more of Kay's memories of Lynn in our September post here. You can read some Amazon customer reviews here. To help raise awareness, please ask your local library and local book shops to stock copies of this book and also Lost Voices. 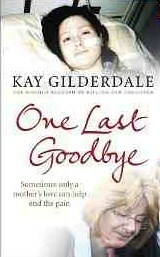 You can buy One Last Goodbye from several shops or on-line in paperbook or ebook format from The Random House Group. If you buy through the Easyfundraising site, e.g. 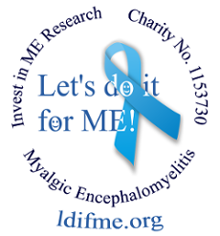 from Amazon or The Random House Group and choose Invest in ME as your cause, the charity will receive up to 2.5% of the price as a donation, with no extra cost to you. UPDATE: Voices from the Shadows is now available for those in USA and Canada to view online on MUBI and for those in UK and Europe to buy on DVD. You can watch the trailer here. To raise awareness, you could send these links to your MP, GP, local and national media. The film won the “Audience Favourite Documentary Award” at its world première at Mill Valley Festival, California in October 2011. Invest in ME hosted the film's UK première in Norwich and also in London in December. Thank you for your support in raising awareness of severe M.E. *Remember ME is a fundraising page on Everyclick for sponsors wishing to donate to our cause in memory of those who have lost their lives to this disease.